After growing up in Michigan, a 25-year-old Jeffrey Brown moved to Chicago in 2000 to pursue an MFA at the School of the Art Institute. By the time he finished his studies, he had abandoned painting and started drawing comics seriously. His first self-published book, Clumsy, appeared seemingly out of nowhere to grab attention from both cartoonists and comics fans. Established as an overly sensitive chronicler of bittersweet adolescent romance and nonsense superhero parody, Brown's current direction remains split between more autobiography examining the minutiae of everyday life and whatever humorous fiction he feels in the mood for, and a wide range of fiction subjects in his new series SULK. His most popular works include Clumsy, Unlikely, AEIOU, and Every Girl is the End of the World For Me, comprising the so-called "Girlfriend Trilogy" and its epilogue. More recently his autobiographical work has included Little Things and Funny Misshapen Body. His humorous works include Bighead, I Am Going To Be Small, Cat Getting Out Of A Bag and The Incredible Change-Bots. Jeffrey's work has also appeared in a host of anthologies from McSweeney's to the Drawn & Quarterly Showcase, as well as local newspapers such as the Chicago Reader and NewCity. Brown has been featured on NPR's This American Life and even created a short animated music video for the band Death Cab For Cutie. 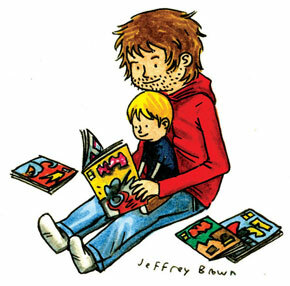 Visit jeffreybrowncomics.blogspot.com for news and drawings, and you can write to him at: PO Box 120, Deerfield IL 60015-0120, USA.